Work will be a bit hectic for me on Friday so I will be in later Friday night. Planning on staying in Julian Friday and Saturday nights. We're enrolled. We'll see y'all in the morning! imswiney56 posted a topic in Adopt a Trail and Other Trail Maintenance Issues, Volunteer Trail Days, etc. Hello all, Just a thought on my lunch break at work. I was wondering if anyone was thinking about contacting the local Forest Service Stations to see if any areas/truck trails needed some service due to recent rains. I understand that riding ruts are fun and all, but I know back home in MO if the trails are too rutted up and nobody services them, the rangers shut down the trails for a while. I've got a packable shovel and a cut down hoe that could be used to help even out some ruts on trails to possibly get more spots remaining open. Might even help leave a better impression on some newer FS folks that may not be keen on the OHV community. I'm down for 2 if possible. My wife is interested incase I go down riding while we ride together. I'd like to volunteer. I've got my truck (Diesel crew cab 4x4) to help however I can. I might have a buddy that's new to the community that could be interested as well. I've had really good luck with Clairemont Cycle Supply and C&D Cycle. Both smaller shops with honest people. Might be worth giving them a call. imswiney56 replied to Riggerdan's topic in INFORMAL Local Rides & WHO'S GOING RIDING ! I'm going to try and make it. I leave for Missouri on Wednesday so this weekend will be spent packing and loading the truck. I'm also gonna try and get a few folks from some of the other Light ADV/Dual Sport Facebook pages on here as well so they can check it out. imswiney56 replied to ADV Bum's topic in Adopt a Trail and Other Trail Maintenance Issues, Volunteer Trail Days, etc. I should have a set of loppers by then, but I've got no problem doing grunt work! imswiney56 replied to imswiney56's topic in INFORMAL Local Rides & WHO'S GOING RIDING ! I checked their website and it said both Palomar Truck Trail and High Point Truck Trail are open pending fire or rain. I'll probably call on Friday or Saturday to see if they are planning to close it or not. *Update* As of now my plan is to meet up in the gravel lot on the North side of Julian Pie Company in Santa Ysabel Sunday October, 7th at 0730. Pre ride checks and top off tanks then stands up at 0800 taking the 79 North. Times can be pushed to the right if people need more time to make it to Santa Ysabel. I need to ride out there this evening to double check gates and everything, but looking at pulling onto the trail at "33.3309 -116.70914" Keeping on Palomar Divide Truck Trail/Palomar Divide Rd, we'd stay left at "33.337099, -116.778723". Stay right at "33.339643, -116.787892" Taking the right fork at "33.362607, -116.826500" to turn onto High Point Truck Trail/High Point Rd. Hard left at "33.376270, -116.826930" to stay on High Point Truck Trail/High Point Rd. Trail ends at "33.440116, -116.857085". Right on the 79 back to Santa Ysabel, then left towards Julian for lunch/pie/drinks. https://www.plotaroute.com/route/697585 The plan is to make periodic stops on the trail to allow individuals to catch up, get pictures, get a drink, and grab a snack. I am thinking about going to Heroes Restaurant in Julian for lunch. From what I have been told, they are riders themselves and they are extremely patriotic! I am hoping that a later lunch will allow us to dodge most of the weekend Julian foot traffic. I'm definitely interested in joining, just wondering when and where. 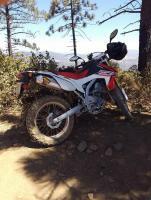 imswiney56 posted a topic in INFORMAL Local Rides & WHO'S GOING RIDING ! Thinking of riding tomorrow (Monday) through Poway, up to Santa Ysabel or Julian for pie then maybe a trail if someone recommends. Anyone care to join?